Bedarra Island is the closest thing to tropical paradise in Australia, both the Villa and the Studio are positioned near the waters edge on a private two-acre estate which wraps around a palm-framed white-sand beach. Prominent artists, photographers and writers consider Doorila Cove to be the most beautiful beach on the island. Here you can swim or snorkel for hours in the warm clear turquoise waters of the coral sea. The functional design of the Villa is languidly relaxed, yet comfortably modernist - with interiors by renowned interior architect Ian Moore. The Villa has two queen-sized bedrooms and an open-plan lounge/dining space which expands out to a large deck. All enjoy stunning views of the beautiful coral sea and the distant islands, extending to the oceans of the Great Barrier Reef, South Pacific and beyond. The Studio is a separate structure annexed by a huge bamboo fence, ensuring privacy from the Villa (the properties can be booked individually or together). Originally built by prominent artist Noel Wood in the early 20th century, the Studio was his residence for more than 50 years. Since renovated by Ian Moore, it maintains many original features including the gin and cognac bottle feature wall, a stone fireplace, bamboo paneling and a collection of original bamboo furniture items handmade by Mr Wood himself. A king-sized bedroom with an ensuite lies in its own pavilion, separate from the large open-plan living/dining area. There are only a small number of private homes on East Bedarra Island and there is no public access - so you will never see any day-trippers. The property and its surrounds have been documented in many books and magazines, including Wallpaper, Vogue Living and Belle. The Villa also featured on Channel Seven's travel show The Great Outdoors. Travelling to Bedarra Island will be relished by those who love a sense of adventure. This is a getaway in every sense and once there you'll feel as though in another world where you can unwind in seclusion, but not in isolation. Our caretakers will wait on the beach for your arrival by boat to help you land - literally and figuratively - on your island in the sun. Truly Paradise Found. - One bathroom with separate shower and toilet. - Nearby caretakers to assist you with any needs. - Complete privacy - no day trippers are allowed on the island. 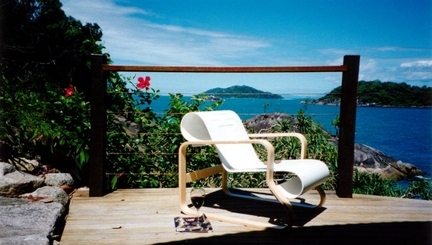 - Magnificent views of the sea and neighboring islands. - Modernist design interiors by Ian Moore. - Outdoor dining and lounging areas with barbecue. - Kayaks, snorkeling gear, fishing reels. - Boating facilities available from nearby Dunk Island Resort. - Alternative beach only 50 metres away. - Cable TV, DVD player and CD stereo. - Superior linen, toweling and Aveda toiletries. - Fully equipped laundry facilities (shared with The Studio). - The Villa allows for a maximum of 4 guests. - One kind-sized bedroom. A daybed in the living area can sleep one adult or two small children. - Surrounded by a bamboo fence and palm trees. - Views through the palm tress. - Open-plan living area which includes kitchenette. - Alternative beach only 50 meters away. Please note: The Studio, with its stone floors and bamboo walls and ceiling, is suited to guests that enjoy a rustic experience. It's fully screened and the kitchen and bathrooms are simple yet functional. The building is constructed of bamboo with glass windows and a tin roof. The bedroom/bathroom is in a separate pavilion just three steps away. During the tropical downpours the property is protected from the winds yet the tin roof can be noisy and may not suit some guests. Minor interior decoration changes are made from time to time. The popular option is to fly to Cairns Airport and take a small aircraft flight for 15 minutes to Dunk Island. From there catch a 15-minute boat ride on the 'Beachcomber' fast cat to Doorila Bay (East Bedarra Island). Alternatively you can hire a car from Cairns and take a scenic two-hour drive to Mission Beach, catch the water taxi to Dunk Island and then the 'Beachcomber' to East Bedarra. High flyers can charter a helicopter from Cairns Airport to drop you on the beach at Bedarra Island. Villa + Studio: $990.00 per night. Three-night minimum stay. An additional $50 linen charge applies for each bedroom used.